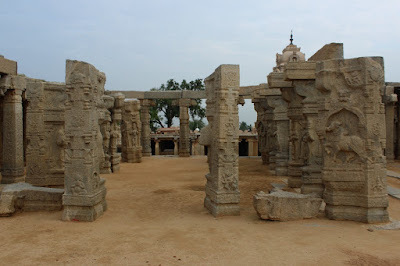 We reached Lepakshi early morning, even before Sun had risen over the horizon. We spent some time marvelling at the colossal Basavanna ~ Nandi. The baby faced squatting Basavanna is facing its lord at Sri Veerabhadra Swamy temple, a big Shivalinga sheltered by a seven headed serpent. Its a two minute drive through the narrow streets of Lepakshi to Veerabhadra Swamy temple. Here we are standing in front of a temple which is known for a hanging pillar, ceiling paintings, designs used for saree borders among other awe inspiring creations. 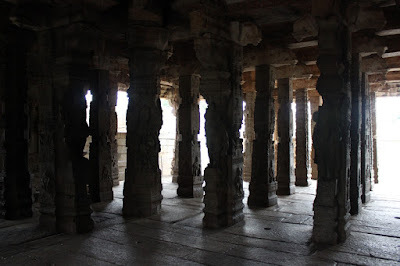 One look at the temple architecture, one can easily tell its Vijayanagar style. Close to the temple entrance is a government planted board.. The earliest inscription in the temple is dates Saka 1455 (1533 AD). as per the tradition, this temple was built by Virupanna who was subordinate officer of Achyutaraya. The temple is inside two enclosures. There are three entrances to the first enclosure. 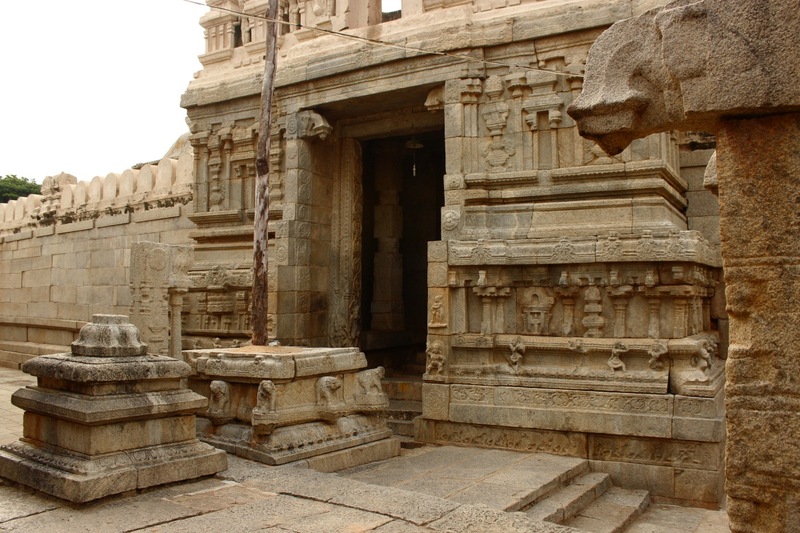 The entrance to the north is surmounted by a Gopura which is the main entrance. 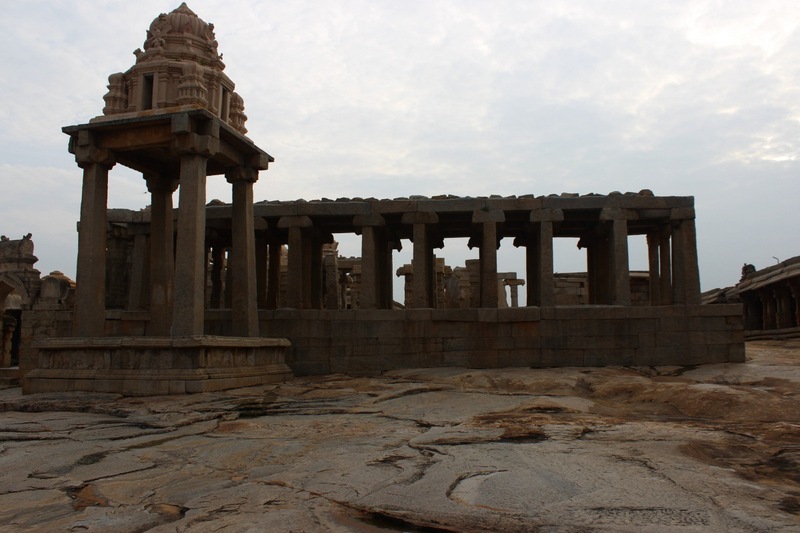 The shrine is situated in the center of the second enclosure, faces the north and consists of Garbhabgriha and Antarala surrounded by a Pradakshina, Mukha Mandapa, a pillared corridor. At right angle to the Mukha Mandapa is the shrine of Vishnu facing the east. There is a shrine dedicated to Siva under the name Papa Vinaseswara facing the Vishnu shrine and to its south is the Parvati shrine facing the west. In the western wing od Pradakshina surrounding the Garbhagriha and Antarala of the Veerabhadra shrine there are three shrines known respectively as Ramalinga shrine, Bhadrakali shrine and Hanumalinga shrine all facing the east. In the north corner of the Mukha Mandapa there is a Vedi with Navagrahas. The temple is renowned for its Maha Mandapa which has exquisitely carved pillars with life size figures of Tumbura, Dattatreya, Brahma, Narada, Rambha, Padmini and Nataraja. 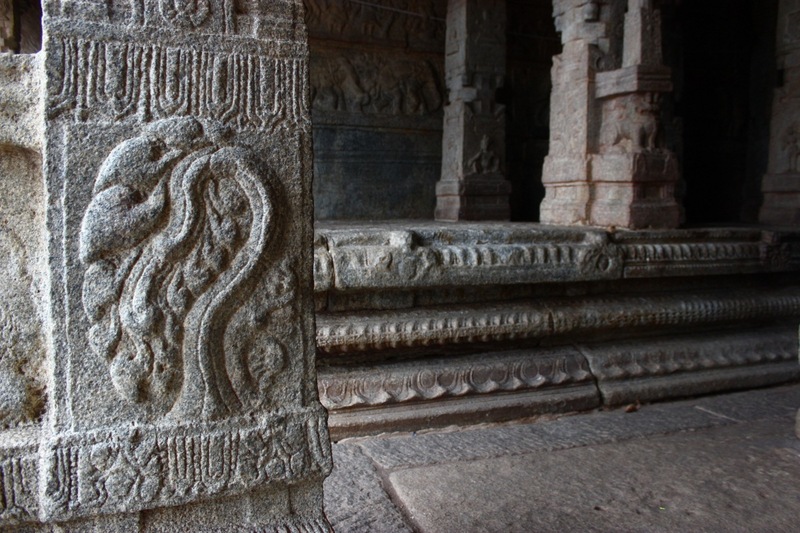 The paintings in the Maha Mandapa as well as Mukha Mandapa are master pieces of Vijayanagara mural tradition. 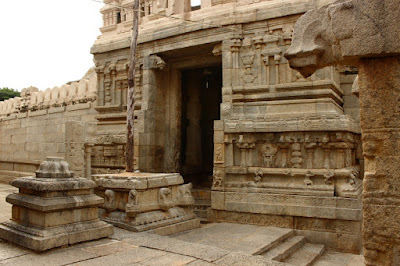 This is the second entrance over which there's a Gopura. The space between the outer and inner entrances is quite narrow. The pillar base has made the space even tighter. For some reason there's a wooden pillar rather than a stone pillar. 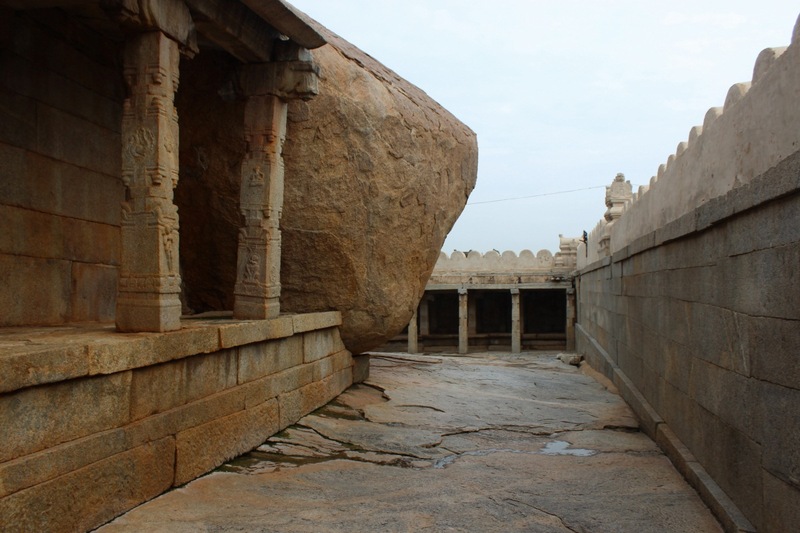 Since the temple is built entirely on a rock, it seems the builders try to squeeze in everything into the limited space. Once past the second entrance, we step into the pillared hall. 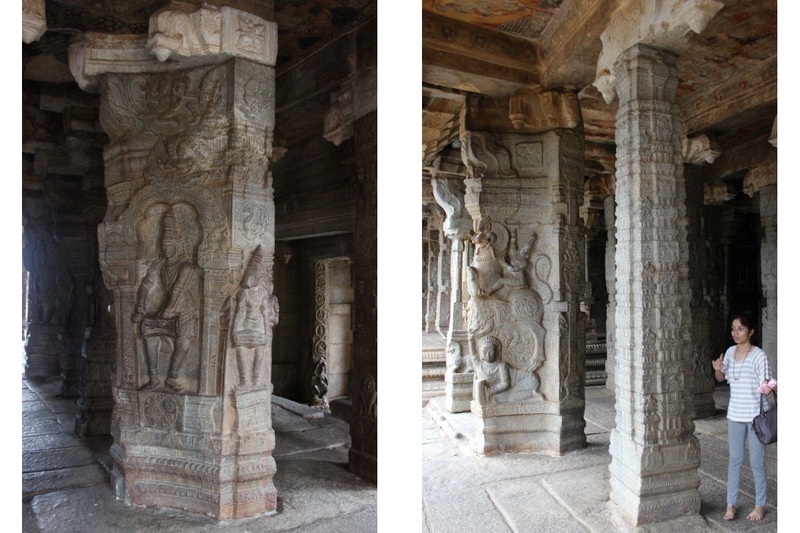 Each of the pillars are exquisitely carved and depict various characters from Hindu legends. The pillars around the hall center are much larger and complex in design.. they kind of create a circular feel to the hall center. 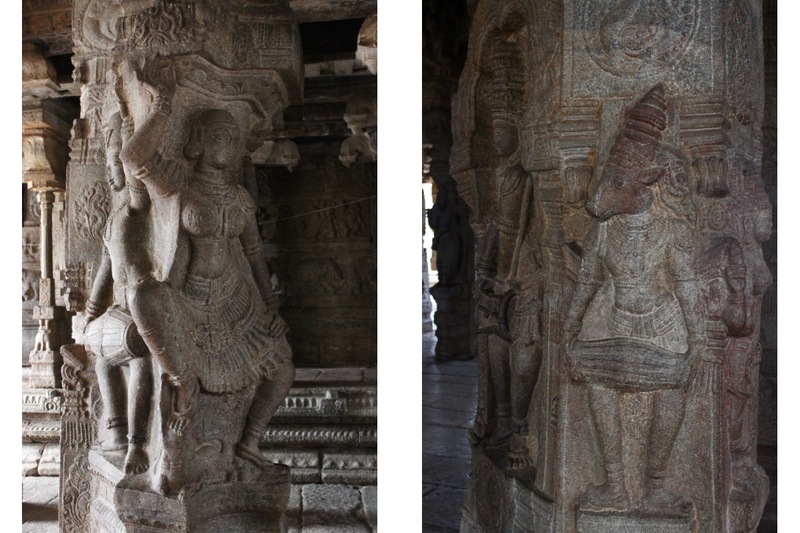 Here're two examples of such pillar. If you notice the pillars' base they have curvy edges and seems to be wider at the top. I think the hall center is a stage where dancers performed. The pillars around the stage depict musicians and dancers.Also the hall ceiling is covered with colored paintings. These paintings tell the story of Girija Kalyana i.e. Shiva and Parvati's wedding. These paint used in these art works are made of vegetable colors and minerals. The paintings have survived with little damage by seeping rain water. Turning our attention back to the pillars, we have here a dancing beauty and Nandi playing Mridanga. There are guides available at the temple who can describe interesting stories out of these sculptures. 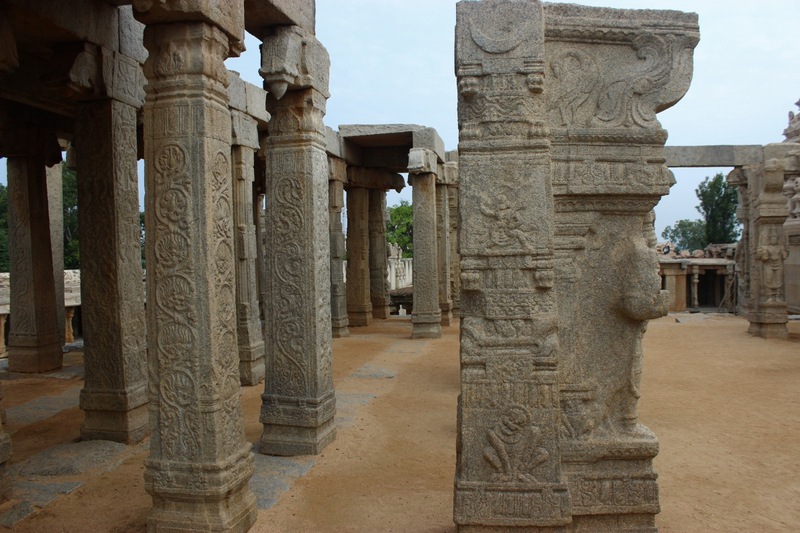 Vijayanagara builders had adopted a pillar design which had 8 or 12 square or rectangular faces which carried images of plants, birds, animals, fishes, humans and geometric. I think they weren't simply decorative but it also helped educate people, especially children about fellow living creatures. It was a very simple way to see and learn. Here's one example of a beautiful plant.. probably some type of vine. Among these pillars some where is an owl. Owls are generally considered bad omen yet its is depicted here. Its likely a crow would also be present some where. ...OK, now don't expect to see a sculpture of a mosquito. Standing at the pillar hall's border. 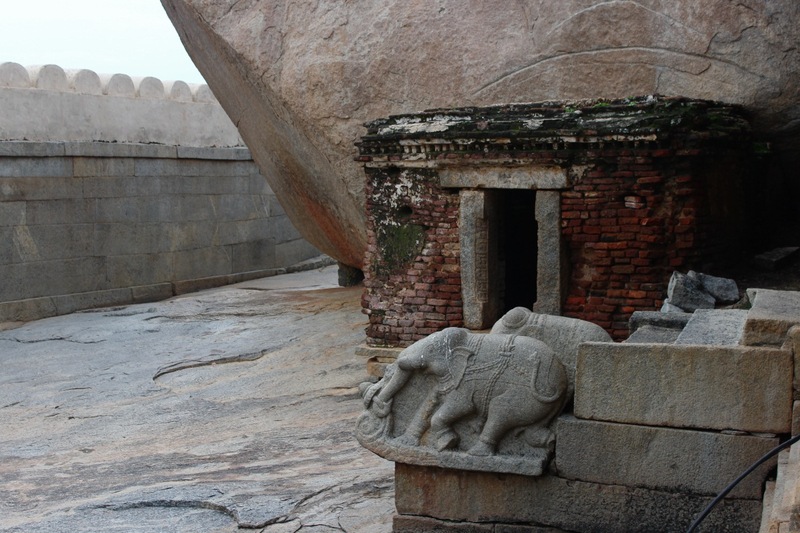 The flight of steps flanked by handsome elephants. The builders left this boulder untouched.. I guess they wanted to give a natural touch besides saving effort in removing it. There's another boulder behind the temple into which Ganesha's idol has been carved. The temple's innermost part is out of bounds for photography. That's where all the shrines are located. Being covered on all sides the inner temple would be dark if not for the oil lamps and electric lighting. The air inside smells of bats though the place has traffic and rituals are performed daily. Now are going around the temple; on the right is the inner wall. On the left is a sheltered corridor where pilgrims could camp or rest. Here, on the right is the south-eastern corner of the temple. 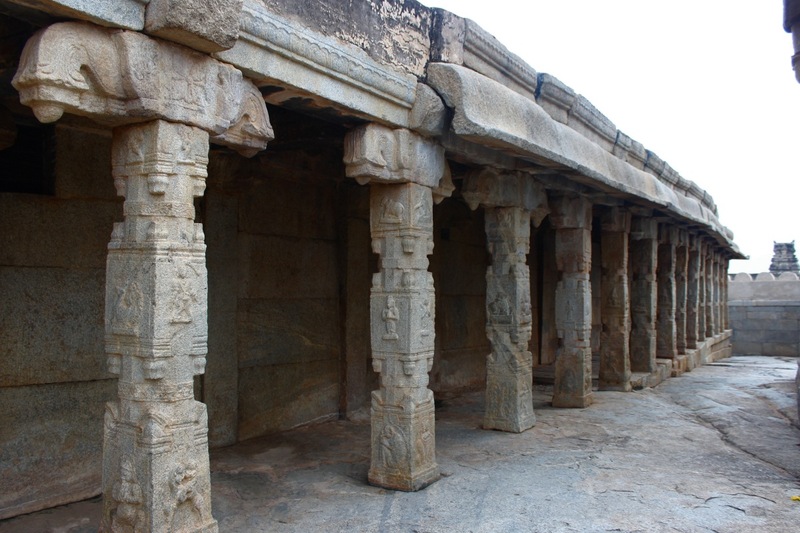 Along the rear wall of the temple runs this pillared shelter. Each of the pillar faces carry unique images. Anyone resting here can simple sit and gaze at the beautiful creations. I guess the beauty of Hindu temples have the power to distract a mind from unwanted thoughts. On the left is another temple but I have no idea which god this is dedicated to. 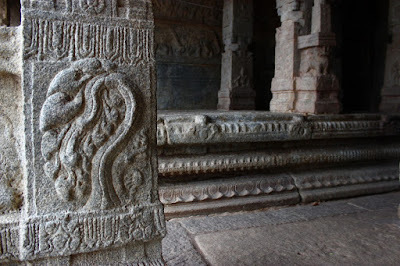 And straight ahead is the great seven headed serpent sheltering a Shivalinga seated in its coils. The serpent is carved out of a rock and the extra rock is left as it is. One its northern face is a set of images - Shivalinga and a spider, Shivalinga and Bedara Kannappa and Shivalinga being showered by an elephant. Together, these images means SriKalaHasti. Sri is spider, Kala is serpent and Hasti is elephant. 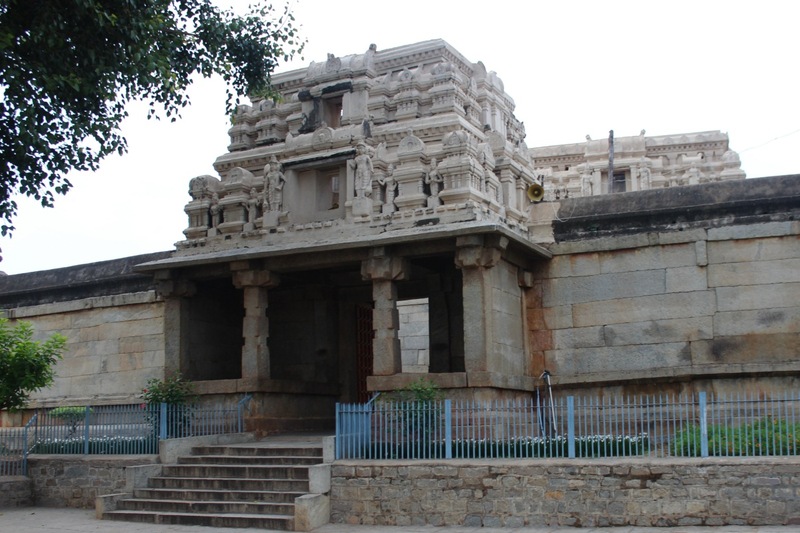 Srikalahasti is an important holy place dedicated to Lord Shiva which is connected to a disciple Kannappa (member of a hunter tribe). 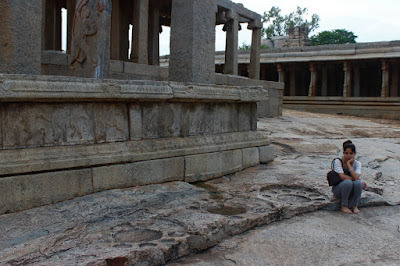 Kannappa was devoted to Lord Shiva and his form of worship was completely unacceptable to people. He would carry water in his mouth, flowers in one hand and meat in the other. He would spit out water onto the Linga (normally people bring water in a clean vessel or a pot) then he would offer flowers and meat. His every action was considered unholy.. Once while worshipping, Kannappa notices a pair of eye s on the Shivalinga. He's very happy that his Lord is pleased with him. Then suddenly one of the eyes starts bleeding. Kannappa unable to bear to see his Lord suffer, places a toe over the eye to stop the blood flow, gouges out his own eye and puts it over the bleeding eye. Now his lord's eyes are fine. So Kannappa is looking at his lord with his remaining eye. After a while the other eye on the Linga starts bleeding. 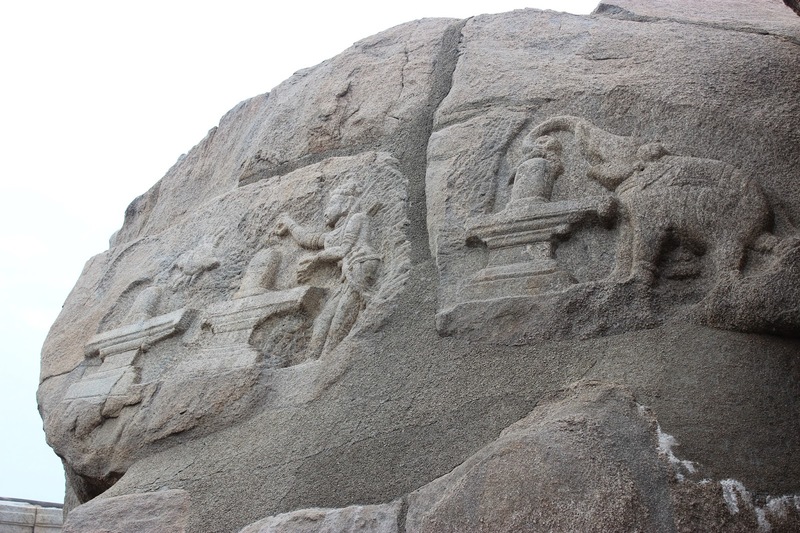 Again Kannappa gouges out his remaining eye and offers it his Lord. At that point Lord Shiva appears and heals Kannappa's wounds and restores his vision. There are different end to the story but the moral is to convey Kannappa's devotion. The rock also carries an image of a seated Ganapati. 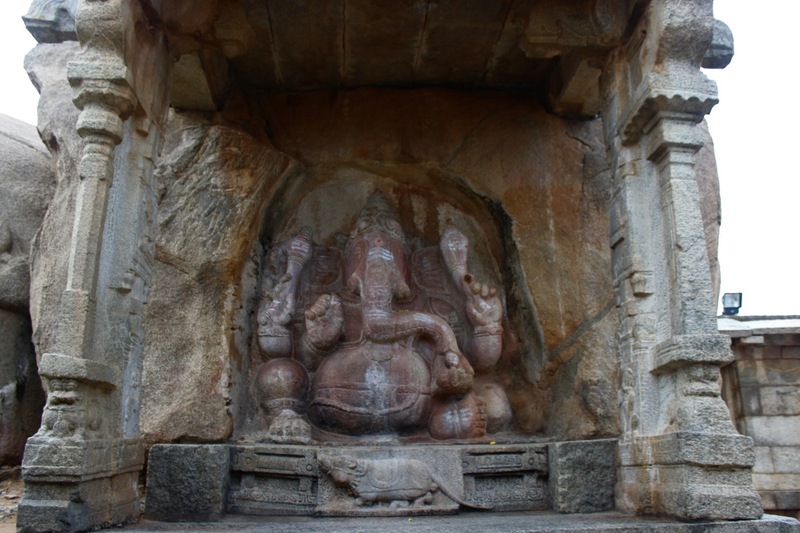 A two pillared Mantapa shelters Ganapati from sunlight and rain. Another view of the pillared shelter. Notice the lintel level - the assembly is pretty complex. The weight of the beams are transferred to the self-supporting columns. And they have remained intact for five centuries! The ancient builders had thorough knowledge of every aspect.. selecting the building site, the building orientation, what type of stones to use, the building design, etc. I'd heard that sculptures used specific stones for male and female gods. Now we are looking at a wall which has a different kind of story in it. Rather a sad story. The temple was built by two brothers- Viranna and Virupanna. Virupanna who served the king as a treasurer. He was accused by court nobles of drawing funds for temple construction without the king's permission. The nobles also accused him of trying to outshine the king by building a grand temple. The king orders Virupanna to be blinded. Virupanna to prove his innocence, gouges his own eyes and dashes them against this wall. The bloody eyes have left everlasting marks! The guide who narrated this story also told that samples were taken off the wall and proven to be human blood. Well, this is not the first story where a king believed false information and punished an innocent. There's a story about Krishnadevaraya himself punishing his innocent prime minister and his family. The punishment given was same - blinding. 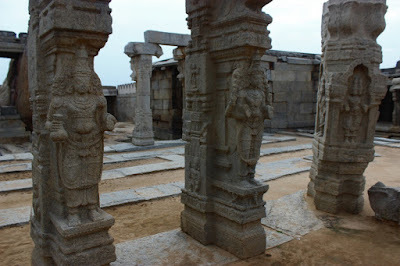 Turning our attention back to the sculptures.. now we are looking at the unfinished Kalyana Mantapa ~ the wedding hall. Like the temple, this wedding was also a grand plan. Here's one lovely image of cranes bending their necks backwards.. what a graceful stance.On the left are the columns with floral designs - these are the ones which are used for saree borders. 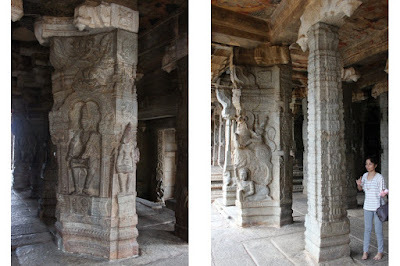 Pillars depicting various Hindu Gods. It's a Hindu belief that a wedding should be conducted in a sanctified place in the presence of the divine. Hence this grand design. 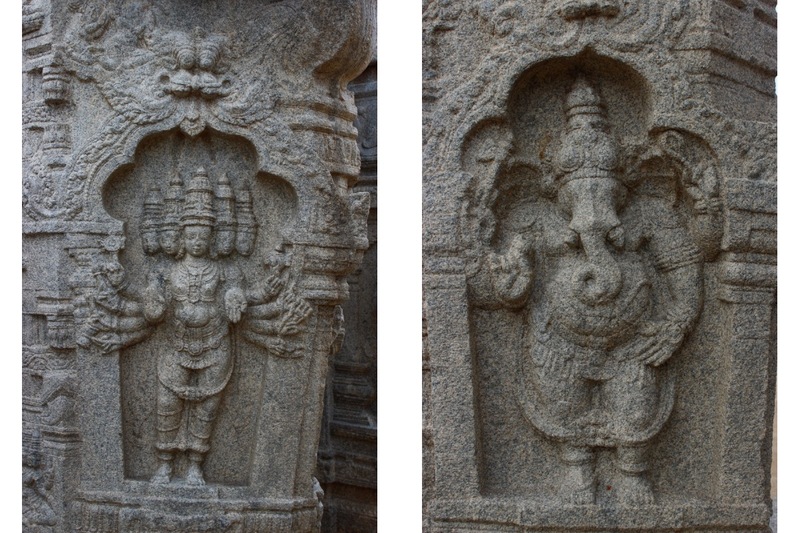 Five headed Vishnu and standing Ganapati. 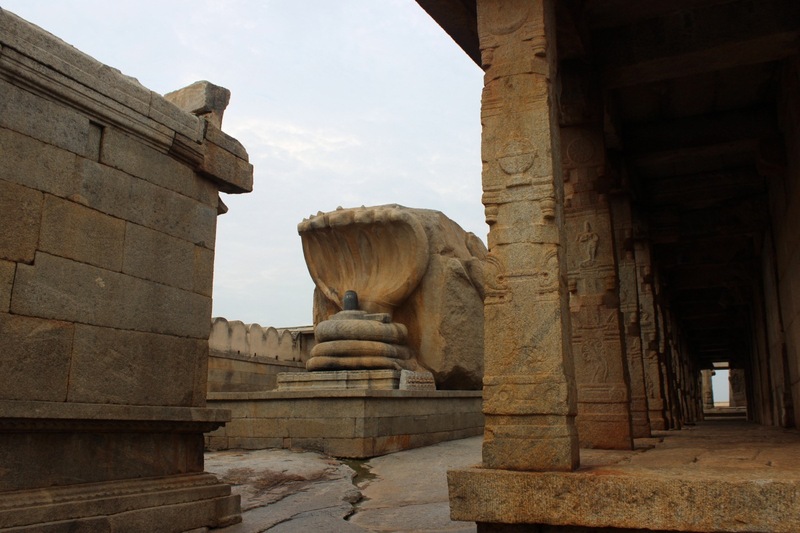 The multi-pillared structure is Kalyana Mantapa while the taller Mantapa shelters a sculpture of Lord Hanuman. Close to the Hanuman Mantapa, there's a different type of sculpture - a larger than life-size human foot-print. 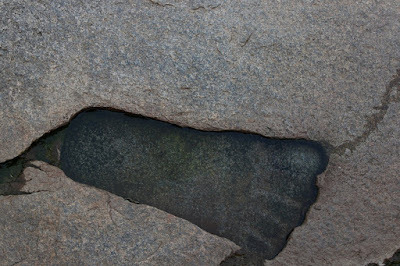 During an earlier visit, the guide had mentioned this foot-print to be of a legendary character. Probably Hanuman. Whoever it's connected to, I'm not sure why there's only one. One more surprise. Palettes carved in stone. These could have been used to mix colors for the ceiling paintings. The palettes has 10 equal pockets around the central pocket. The overall diameter is approximately 2½ feet. I believe these are color palettes but our guide told us they were used as food plates - rice is served in the center while the surrounding pockets were for side dishes. Hard to accept them as food plates but can't reject it altogether. Two more palettes here, that makes it five in all. One of the palettes here has an inscription. The script seems to be Telugu.In the background is a pillared hall probably a lodge for travelling pilgrims. The tree seen here is a Frangipani. Somehow Vijayanagara temples seem to have Frangipanis.. I remember seeing them in Hampi and Anegundi too. One thing I know.. Frangipanis grow well on granite hills.. so wondering if that's the connection between these granite block structures and the lovely plant. There's a lot more in this temple than what I've managed to show and tell. Between the inner wall and the outer wall on the eastern side is an open space with lot of inscriptions on the floor and also on the walls. Instead of recording the message on slabs, the inscribers have chosen the rock-bed and walls for a reason. Slabs can be displaced easily but not walls and floor. 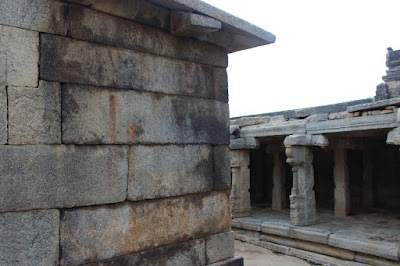 It is called Sita hejje and the other one is said to be on the hill of Penukonda. 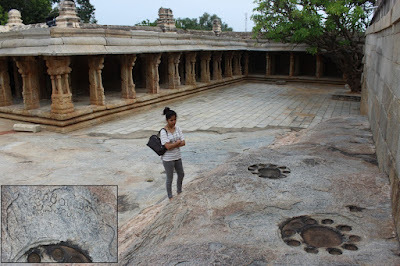 Though we didn't find it during our Penukonda trek or may be we missed it. Nice pictures and narration. What to see in Raichur District?